It all started back in Corfu in 2006 when I was on holiday in Arillas with my friend. I was bitten so badly, more so than I ever had before and I was covered head to toe in bites. They were on my neck, down my back, all the way up my legs, even on the inside and rather than just being bitten, I had a severe allergic reaction over night. When I woke up I didn’t just have little red dots all over me but ginormous swollen blisters that were so painful to touch. My legs had swollen up that much that I could hardly walk or get out of bed and every position that I tried to lie or sit in hurt so much. We got the doctor several times who had to give me injections, a ridiculous amount of tablets to take and the blisters were that large they had to be drained. I was left with open wounds all over my legs that took ages to heal, leaving big scars that have taken years to fade. Not to mention that I was actually over dosing every day on the prescription of tablets that I had been given. Needless to say, it was an absolute nightmare. A couple of years later, I was in Egypt and the exact same thing happened again only this time it was within a matter of hours of arriving at the hotel. Nothing causes quite a stir as having to call the emergency doctor out when you’ve just checked into a hotel. After that trip, I had to have several appointments with a specialist back in the UK and now I have my own prescription medication to take away with me should I be bitten again. The trouble with my body is that because I’m allergic to the bites, absolutely nothing that I can buy over the counter, at least in the UK, can stop the reaction that I have. Its not just a case of taking the sting or the itch out of the bites; I could cope with that! So with that in mind, prevention is better than cure for me and really, I’d say that would be the case for everyone really as I’m sure no one would actively go out of their way to be bitten. While I don’t get bitten in every country I go to, I never know whether I’m going to be bitten until I get there so I like to take all of the insect repellent products away with me that I need to ensure that I’m doing my absolute best to not get bitten. I’ve found several products that work really well for me and want to share them with you. The vast majority of the hotels that Mr WLL and I stay in when we go away spray the hotel grounds which really helps to keep the mosquitos at bay. Some hotels will also spray your room for you if you request it. When we were in Sharm El Sheikh, we were staying at the Ritz Carlton which is sadly no longer there, and they were kind enough to spray our room every day to try to limit the chance of me being bitten. It sounds so over dramatic but if you could see the state my body was in with bites, you’d completely understand where I’m coming from. For the vast majority of people, there are a few steps that you can take to help to prevent mosquito bites. Starting with an insect repellent plug in. The best one that I have found so far is the Jungle Formula Mosquito Killer Plug In that you can buy from Boots. It is around £10.99 which might sound like a lot to pay depending on your budget, especially when there’s always so much to buy to take away with you on holiday but it is a small price to pay to help you to avoid being bitten while you’re away. Inside the box you get the actual plug in and then the cartridge of liquid that you twist unto the plug in bit. Its really easy to do, then you just plug it into the wall and switch it on. For future holidays, you just keep the plug and buy refill cartridges for the plug in. There are lots of these plug ins available on the market, including ones where you have solid tablets that fit on the top of the plug in but I find the Jungle Formula ones with the liquid to be the best there is. For a standard sized hotel room, you would generally only need one of these. If you’re very allergic like I am then I’d suggest taking two or three, especially if you’re staying in a suite then you can have one in the living area, one in the bedroom and one in the bathroom. Another option would be to also have a mosquito net that you put above your bed. The only time that we have utilised one of these was on holiday in Kenya as the mosquitos can carry malaria. We got ours from Boots and it seemed to work really effectively, especially when we were on safari. As well as having a plug in in your bathroom, it is a good point to note that Mosquitos love water as they like to lay there eggs in it. So many people get bitten during the night when they pop to the toilet so something that I have found helps is to leave the toilet seat down when it isn’t in use so that you’re not encouraging them to hang around it. Mosquitos also hate the cold so my advice would be to leave the air conditioning on as cold as you can stand it as that tends to keep them away as well. Plus it feels great when you come in after a long day at the beach. Night time is usually when you’re going to get bitten so its at this point that you really need to step up the protection. When getting ready for a night out, I’d suggest refraining from using anything thats too heavily scented, especially if it is sweetly scented and that goes for shower gel, body cream, hair spray, the lot. I have even stopped wearing perfume on holiday and just use a plain deodorant and have found that that really helps too. I tend to opt for a shower gel that is either scent free, or citrus or tea tree smelling. When I step out of the shower, I dry off my body and then apply a good spray of the Avon Skin So Soft Original Dry Oil Spray. Now this isn’t marketed as an insect repellent but it is a very effective one that so many people widely use to help to keep mosquitos at bay, even soldiers in the army. There’s something in it that seems to warn off the little blighters and after so many people telling me to give it a try, I started to use it a few years ago on holiday and I’ve used it since. It is a dry oil spray that feels gorgeous on the skin, lightly moisturising and gives a nice perfected, especially on your legs, plus it helps to keep the insects away so you couldn’t ask for more! It is on offer here for £2.50 at the moment for a 150ml bottle that will easily last you a 2 week holiday in paradise! Once I’ve put my clothes on, I then spray the exposed parts of my body with the Jungle Formula Maximum Protection Spray. It absolutely stinks and really catches in the back of your throat so I’d suggest using it in a really well ventilated area but as far as insect repellent sprays go, I have never found anything to work as effectively as this one does. It comes in lots of different formulas and strengths but I always go for the full strength with 50% DEET and in the spray formula because it is very quick and easy to apply. If we’re sitting outside on our balcony, we like to light a citronella candle to help to keep the mosquitos away. Although I’m not a smoker, they apparently don’t like cigarette smoke either! We always keep our balcony door closed too. If we’re going to be eating outside or going on a trip out of the hotel at night then I like to wear something long, light and floaty like linen trousers and a top with long sleeves to cover up as much as possible, the same goes for if we’ll be spending time on the beach at night. This helps to prevent being bitten as the mosquitos like to hang around water, especially at dusk. Before we head out for a night out, I like to have what I call my triple threat protection- Avon spray, Jungle Formula Spray and Anthisan Patches. 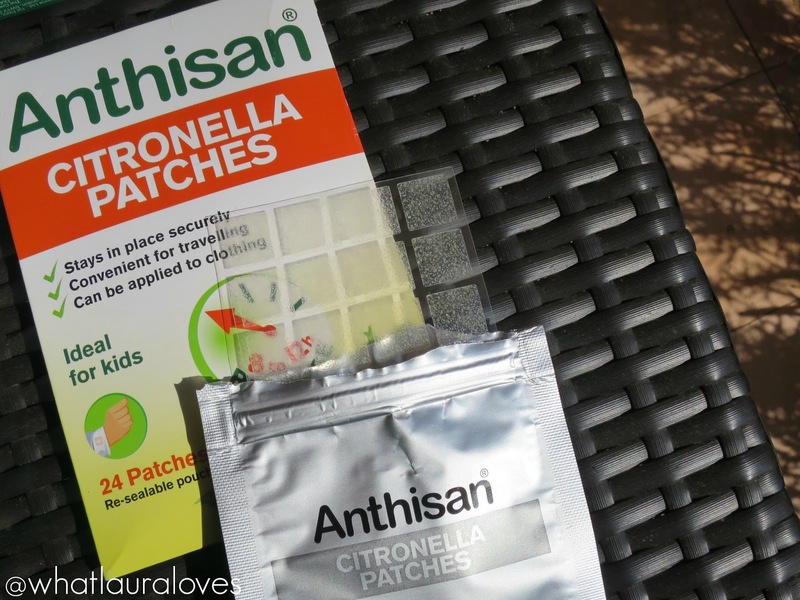 The Anthisan Citronella Patches are brilliant because they’re almost completely clear, textured patches that you stick to your clothing. I pop near to my wrist and one next to the inside of my opposite ankle and then I leave them on all night as they have an 8 to 12 hour release. I’ve tried lots of different physical insect repellents before but these work best in my opinion and I much prefer them to the bands that you can buy as they’re discrete and small. Now if you don’t happen to escape the mosquitos and you’re bitten, there are lots of different products out there to help but the best advice that I can give you would be to not touch them. Whatever you do, DO NOT SCRATCH them. Yes, I know they’re itchy and annoying but tough. You’re just going to have to ride it out. 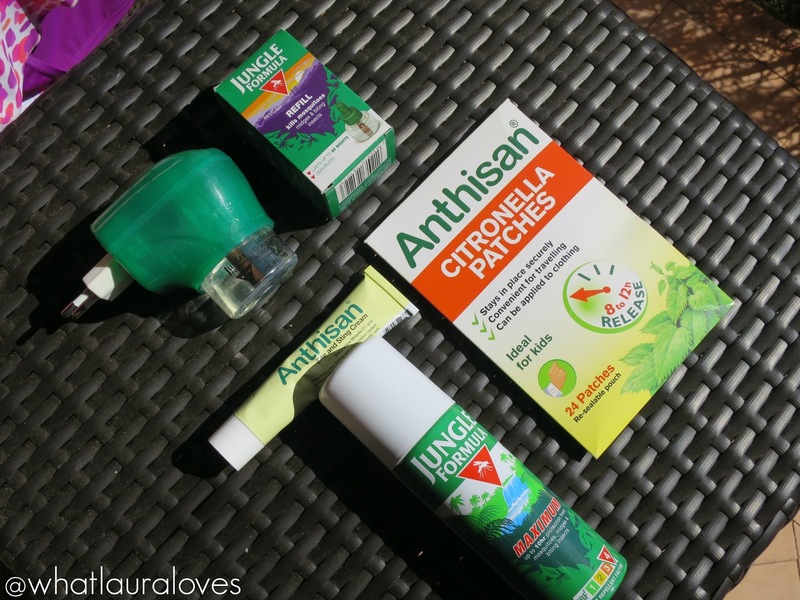 I have my medicated products that I take away with me but if you aren’t severely allergic to mosquitos like I am, then the Anthisan Bite and Sting Cream is very good. Many of my friends have used this while we have been away on holiday and it is the cream that I take away for Mr WLL when we travel. It helps to take the sting and the hot itch out of mosquito bites. My hubby notices that when he has used this cream, there seems to be a reduction in the redness of the bite as well as the hot, itchy feeling so it definitely provides him with some relief when he is bitten on the odd occasion. 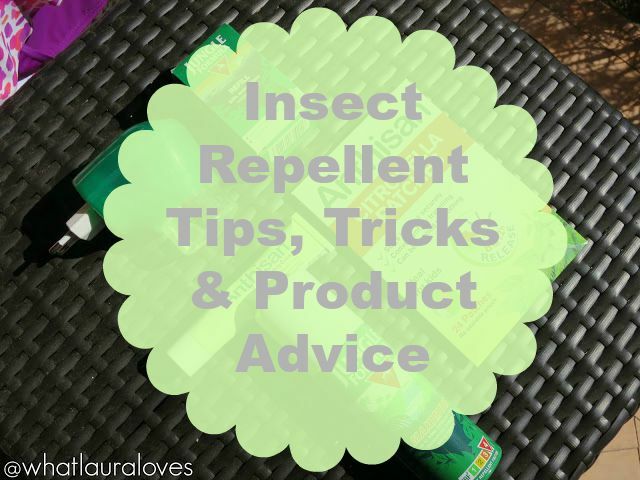 There are so many products out there to help preventing and dealing with insect bites but these are the things that have helped me and that work for me. Some people suggest taking odourless garlic tablets before you go away, other suggest drinking tonic water, neither of which work for me or are pleasant for me to take so it is really down to the individual. Let me know in the comments how you keep mosquitos at bay and if you have any products or tips that have helped you! That sounds horrible:( Mosquitos are the absolute worst bugs ever. Currently sat here with infected bites and facing a week of antibiotics so definitely going to be taking some of these tips!